At Carry the Future, we know how important it is to do something to change the world. We believe that anyone can do something, big or small, to make a difference in another person’s life. On January 20, a group of teens did just that. 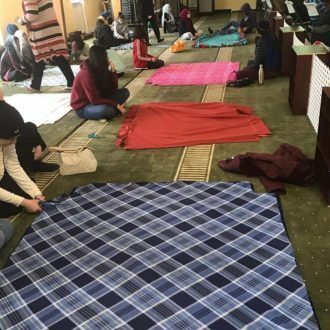 They came together at the McLean Islamic Center in Virginia to make blankets for refugees. Bronislava Shmilovich, on the Board of Directors for Carry the Future, was asked to speak at the event about her experience as a volunteer. She shared stories of helping refugees and the work that Carry the Future does. 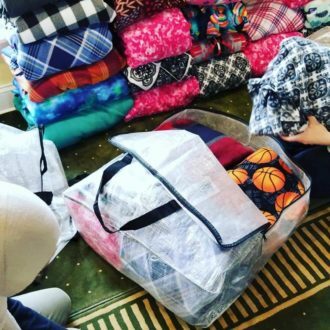 The teens in attendance went above and beyond her expectations: “I was humbled by their inquiries and their attention to the stories of a volunteer and saw a better place at that event amongst that group.” On that cold January day, blankets were made, hearts were filled, and kindness was spread. 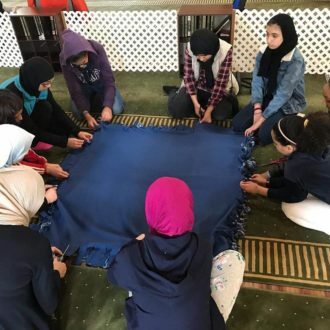 This amazing group of teens made the world a little warmer for 38 refugees, surpassing their goal of making 25 blankets! These blankets will provide warmth and comfort to refugees, but they will also help restore dignity and show love and support. Bronislava left the event feeling inspired: “I am so honored to see so many caring and amazing teenagers show up for those that have nothing. This act of kindness shows that hope and solidarity can start anywhere.” At Carry the Future, we believe everyone can do something. We must all work to reach the hearts of others so that, eventually, we are all doing something to make the world a better place. Thank you, McLean Islamic Center for all you did to bring comfort to refugees! Written by Gwen Skar Click here to see how you can do something!